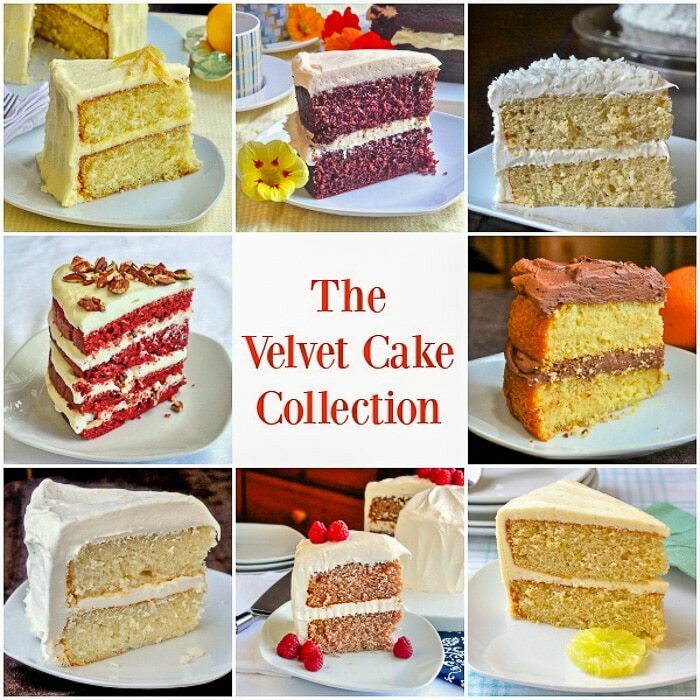 The Velvet Cake Collection. A collection of 9 different versions of a soft, tender, moist, homemade scratch cake like you’ve never tried. From Lemon and Red Velvet to Chocolate Velvet, there’s a favourite here for everyone. My attempt at developing a great Red Velvet Cake was such a success that I couldn’t stop there. The texture was so light, moist and tender that I couldn’t help but try other flavour variations. Since then, I’ve had additional success with lemon, orange and even white (vanilla) versions of this delicious cake. I love lime so with the success of the other citrus versions, that idea was a no-brainer. The raspberry version was an attempt to make a pink cake that worked quite well. I’ve found the best color comes from fresh raspberries in that recipe. The chocolate version too a bit more tweaking but I had so many requests from readers of Rock Recipes that I just had to perfect that version too. these all taste phenomenal but I think people are really in love with the light, moist texture of these cakes, which is the key to their success. Pick your favorite version or try them all. They all make outstanding choices for birthday cakes too; one of these will almost certainly please any taste. Am I done with variations of this recipe yet? Maybe not…I already have an idea for another one. 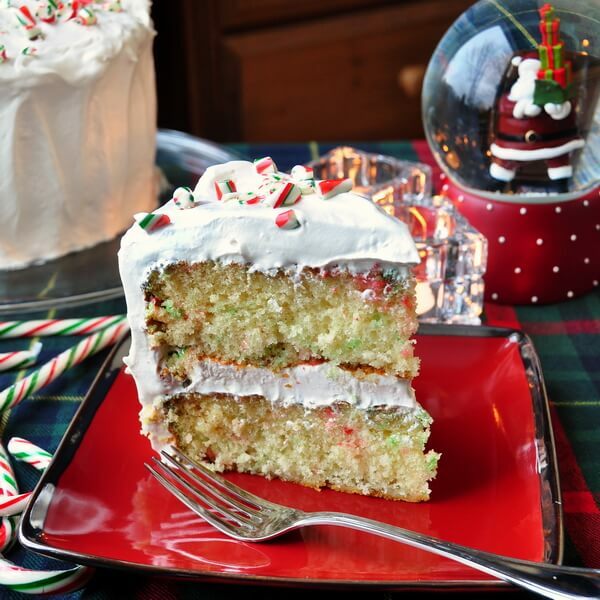 Like this Velvet Cake Collection of recipes? Previous Post: « Crab Cakes Eggs Benedict – on Toutons! Looks amazing. Can’t wait to try them all. They are all quite popular. It’s hard to pick a favorite! That lemon one is probably the most viewed of them on Rock Recipes. I must say I hate lemons but when I made this lemon cake it was AMAZING!!!! Hands down the best cake!!! I have baked for YEARS and these recipes are my go to! The lemon velvet cake is awsome. Everyone loved it when I made it. One question. I used salted butter because that us what I had handy. Does the taste change much using salted butter? I often bake with salted butter and omit any salt in the recipe. I don’t find it makes a huge difference in cake batters. Just curious, but why is the Red Velvet Cake mixed differently than the other velvet cakes? The Red Velvet was the original recipe. I developed the other recipes from it changed the method. I will be trying the red velvet with the same technique soon and might update the recipe. I have no reason to think it wouled not work. Just haven’t tried it as I don’t make a lot of red velvet cake. Can the Velvet collection be used to make cupcakes? They are quite soft for cupcakes but I know people who say they have tried them as cupcakes. I made the Lemon cake and it was just fantastic! I’ll be trying some of the others! Thanks! I have made the Lemon and White Velvet and they were awesome!!! Have you entertained the idea of trying a Pink Champagne Version? Interesting idea but would that have much flavour? I think it would. I do a Pink Champagne Cake, and the flavor is excellent. The trick is a great tasting Zinfandel. And you put just a little in the frosting to brighten it up a little. Adults only treat…. I am looking for a real dense, nicely firm texture yellow cake. What makes this happen? Don’t sift the flour? Add more eggs? I can use this to make your lemon or orange (velvet) recipe.. Check out my Yellow Cake recipe instead. 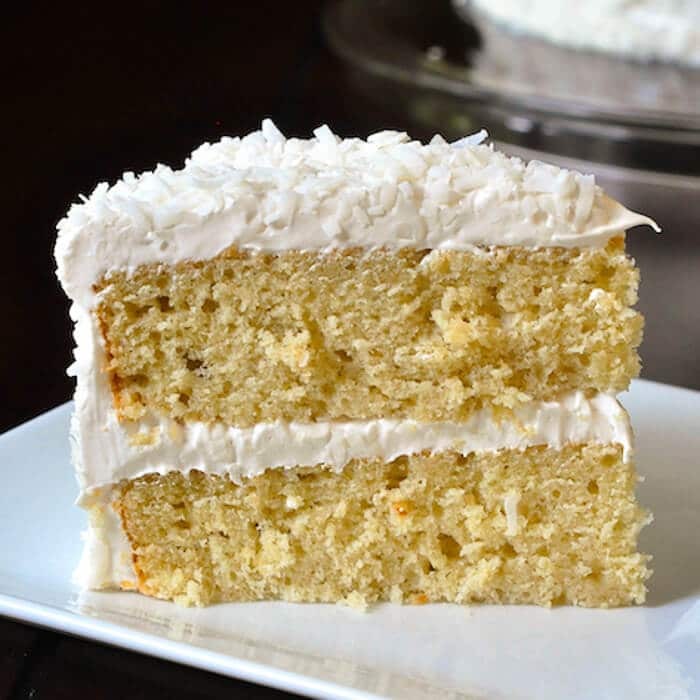 I made the coconut velvet last week and it was absolutely amazing!!!! I couldn’t find natural coconut extract so I used imitation, probably added a tiny bit more that what recipe called for and it turned out great!!! Everyone loved it! My next one is the lemon. That’s terrific Rosemary, The Lemon one is the most popular of them all. Thank you for sharing the lemon velvet. Lemon has always been my favorite cake and I’ve been trying to recreate my grandmother’s recipe for about a decade. This was absolutely delightful! Several people have told me they love this recipe as cupcakes. Have you considered developing a strawberry version? Search strawberry cake on the website. I want the consistency of the texture from the cakes you listed. The orange velvet cake, if you just remove the orange zest does this.make the old fashioned yellow cake with chocolate icing? I want just a good yellow cake with chocolate iving that is not too dry or too dense but somewhere in the middle. Also i used swans down cake flour in my last cake but your recipes call for cake flour and all purpose flour, can you use one or the other and get the same results? I have a different recipe for Yellow Cake. I think the two flours in this recipe is what accounts for the unique texture, along with the rather unique method. Care to share that yellow cake recipe? I love lemon cakes, but so far none seem to have enough lemon flavor to it for me. When I drink lemonade I want it to make me pucker up so much that my face looked like it had a bad botox job done. I want my cake to be as close to that as possible. I made a cream cake and it came out dry, go figure. The only lemon it called for was the peel. I know this has more but is it going to satisfy my lemon mark? Hard to get that much pucker into a straight up baked cake. 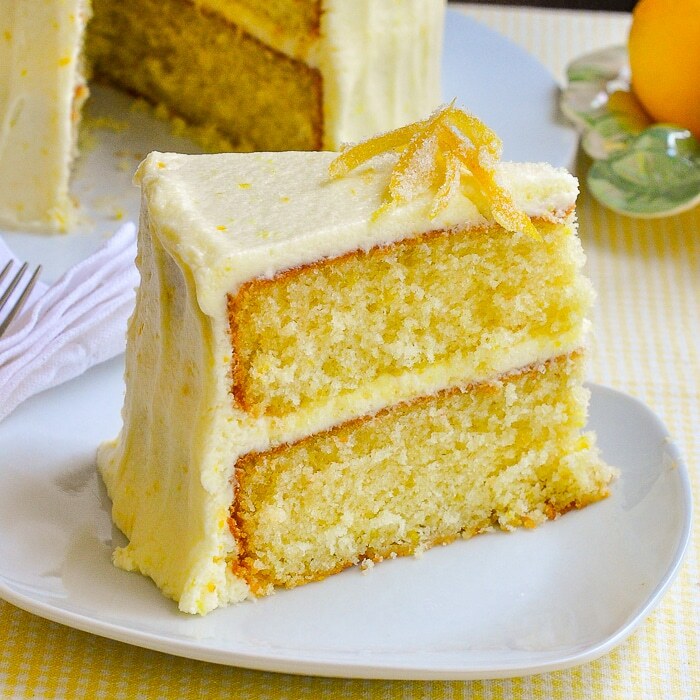 Lemon flavour is one thing but that acidity is what you’re looking for….how about a lemon drizzle cake or poke cake? Havent got coconut extract. How about Malibu?? Hello Barry i love your velvet collection i jave tried the the orange, red,white and res ofcause all my family and friends love it. I was wobdeeing if i can use thw chocolate as a black forest cake….unless uou can please assust with a recipe you have tested and love already. It’s always best and quickest to do a search on the site when asking about individual recipes. There are a couple of different versions of Black Forest Cake here. I have made the lemon & vanilla velvet cakes both are excellent!!….. This evening I will be making the vanilla velvet cake but I will turn it into a spice cupcakes recipe…..I will post later how they turn out!! Hi!, can I replace the shortening for butter? Will lt change the moist texture? It will work as a cake but not the same texture.